Didcot produced an unconvincing display at the Loop Meadow on Saturday and as a result face a midweek trip to South Gloucestershire to resolve this FA Trophy clash with Mangotsfield United. Luke Carnell fired the Railwaymen into a first half lead but the hosts failed to build on their advantage after the interval and Luke Spokes’ free-kick earned the Mangoes a deserved draw. Diddy dominated possession for the first twenty minutes but the only action of note took place at their end as Kyle Tooze was thwarted by keeper Leigh Bedwell block a goalbound effort with his legs. However, Didcot upped the ante and almost immediately after Seth Humphries had a shot saved by keeper Andrew Hannah the Oxfordshire side took the lead. Adam Learoyd’s free-kick was lofted into the area where Carnell swiped at the ball that fortuitously cannoned off a Mangos player and straight back into the tall defender’s path. The second attempt was much more productive; a shot rifled beyond Hannah and into the bottom left hand corner. 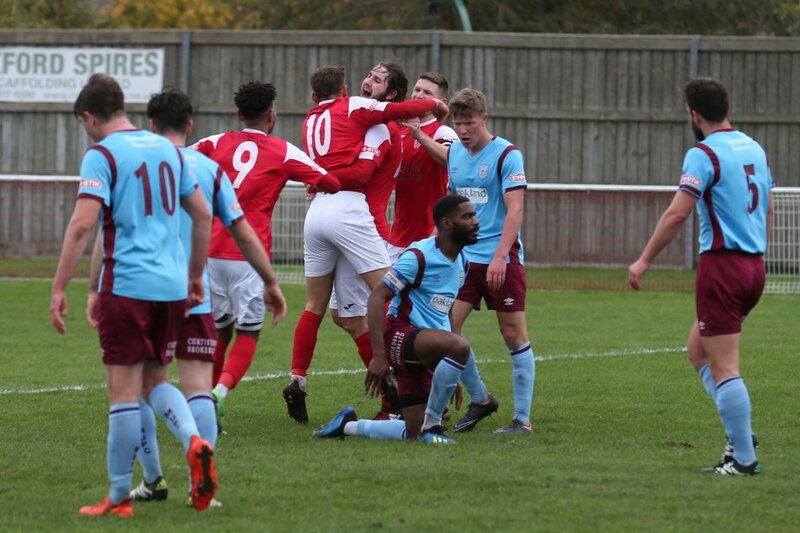 Lance Williams and Humphries came close to adding a second goal while Mangotsfield were still providing enough of a threat to keep Didcot’s backline honest; Sam Hill’s strike from distance was well caught by Leigh Bedwell as the half reached its conclusion. The Railwaymen started the second half somewhat sluggishly and Bedwell had to make a double save to deny substitute Louis Britton. The play was swinging from one end to the other and Morgan and Lance Williams were scuppered by Hannah and a timely deflection respectively as Didcot were unable to notch the critical second goal. The Mangos persistence eventually bore fruit thirteen minutes from time. A free-kick was awarded around 25 yards out from Bedwell’s goal, but the Diddy shot-stopper was powerless to prevent Spokes’ superbly executed dead-ball strike from flying into the top-right corner. Thereafter the visitors were much most likelier to win the game; in added time a desperate goalmouth scramble culminating in a Michael Bryant overhead kick whistling over the crossbar being the nearest they came to booking their place in the next round. G/K. Andrew Hannah, 2. Sekani Simpson ©, 3. James Bloom(Jake Thomas 65), 4. Sam Hill (Louis Britton HT), 5. Tom Warren, 6. Clayton Fortune, 7. Adam Kelly (Matty Tanner 70), 8. Luke Spokes, 9. Kyle Tooze, 10. Michael Bryant, 11. Jordan Williams.